Immediately following the Allied victory of World War II, the French actually did not occupy any portion of Germany, in an effort to reduce animosity between the two historically contentious countries. However, as time passed, small portions were given over to the French by the British and American forces, primarily along the French border. This came at the behest of Charles de Gaulle, the French leader who had been of great assistance to Allied forces in defeating Germany. As a result, there were issued several French zone stamps. There were also Russian zone issues that many collectors find highly desirable. Baden issues began in 1947 when the new state was formed in succession of “old” Baden. Eventually, it merged with Wurttemberg, which was in the American area, forming a state known as Wurttemberg-Baden. The Baden stamps issued in 1948 and 1949 were mainly commemorative postage stamps, as well as commemorative semi-postal stamps for charity. They depicted historical sites that were being reconstructed after the war. Rheinland-Pfalz issues were issued beginning in 1947, but then were re-printed in 1948 when currency reform was instituted. The same designs were still in use, however, and included images such as portraits of Ludwig von Beethoven and Wilhelm von Ketteler, and depictions of the Cathedral of Mainz and a statue of Charlemagne. Another set of stamps from this era were the Wurttemburg issues. 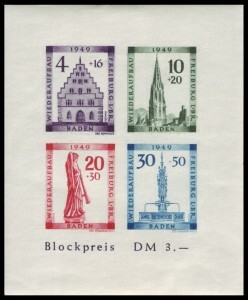 These began in 1947 and remained until 1948, with Wurttemberg-Hohenzollern being issued in 1949. The 1948 stamps were re-issued, like other stamps of the age, with the institution of currency reform. The re-issued stamps were similar to those from 1947, though with some in different colors and new denominations. To learn more about French zone stamps, contact Treasure Coast Stamps for all of your collectiong needs.